Stalled by a cool summer, the fruit on our Meyer lemon tree has been slow to ripen this year. When I picked my first handful yesterday, I knew they had to play a leading role in my holiday hot toddy. I added my version of a ginger syrup I found on the Food Network site. Eager to sample the drink, I decided not to wait for the syrup to chill. Not a fan of bourbon or dark rum, I used my favorite scotch, Famous Grouse. A jigger measure of one and a half shots is equivalent to 1 1/2 ounces. This hit the spot just now after a chilly walk on the beach. 1. Using a vegetable peeler, remove the lemon peel, being careful not to include the pith. Reserve peeled lemons. In a food processor, finely chop the lemon peel and ginger. 2. Using a medium-sized saucepan, add the lemon-ginger mixture, sugar and water. Bring to a boil, then reduce heat and simmer for 20 minutes. Strain syrup and cool. You will have a cup of syrup. 1. 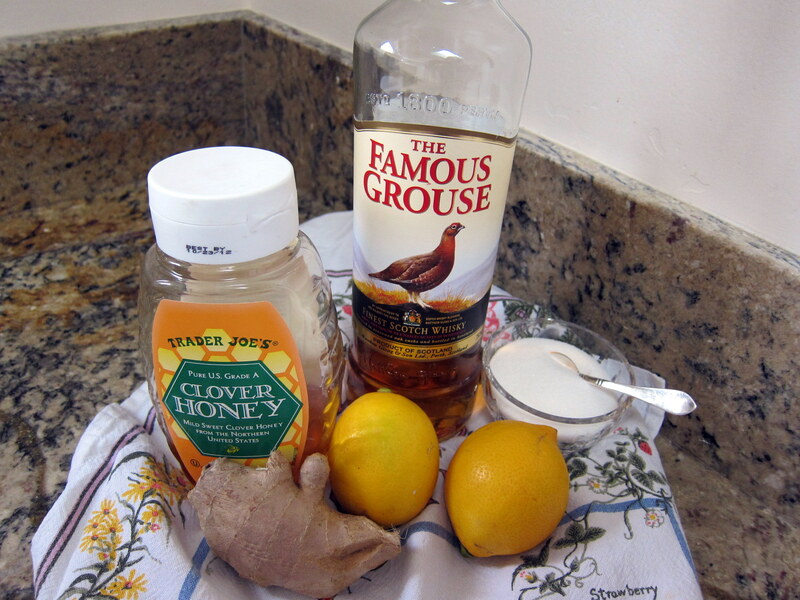 Using a medium-sized saucepan, gently warm the scotch, honey, ginger syrup and lemon. 2. Serve warm in glass mugs. I love your gingery version. We could do with one of your hot toddies right now – in a blizzard at Mammoth! Wish we were there too – the mountain where I learned to ski in my early 30’s. Be safe – should clear tomorrow – very cold here. Meanwhile, take a run for me! we needed this today as we were working putting the nursery back together, it would have kept us warm. This looks like just the ticket for us this afternoon! We’ve had a ton of snow in the last 36 hours and my friend who’s visiting this week and I are heading to a massage and a facial this afternoon. We’re making this when we get back!!! Perfect pamper day! Great minds think alike – just got a pedicure! Thanks – come home safely. I love this syrup! However, I am not a scotch drinker so dark rum would be perfect with this! I’ll have to look for that ginger wine – thanks! Happy New Year – can you rest a bit these days? ?